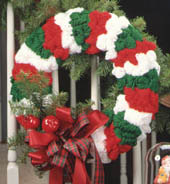 With this easy Christmas craft, create a yarn-wrapped wreath featuring red, white and green bows. This Christmas wreath craft is a quick and easy way to decorate for the season. 1 firm corrugated cardboard, at least 3" x 3". Cut floral wire into fourths (120 pieces). Make sure firm cardboard is cut into a 3" x 3" piece. Wind yarn around 3-inch cardboard 20 times (complete winds). Remove from coardboard. Place floral wire aorund the center of the bow and twist together firmly. Make 40 each of White, Red and Green. Push bows into foam ring in sections of 5 White, 5 Red, 5 Green at an angle to give it a swirl effect. Make sure bows cover the top, front, and inside of foam ring. Repeat the process until the ring is full (24 sections).